Made by the Wasershtrum Silverware, this 925 Sterling Silver Kiddush Cup with matching saucer is decorated with a filigree pattern.Made in Israel, Wt approx 95g. 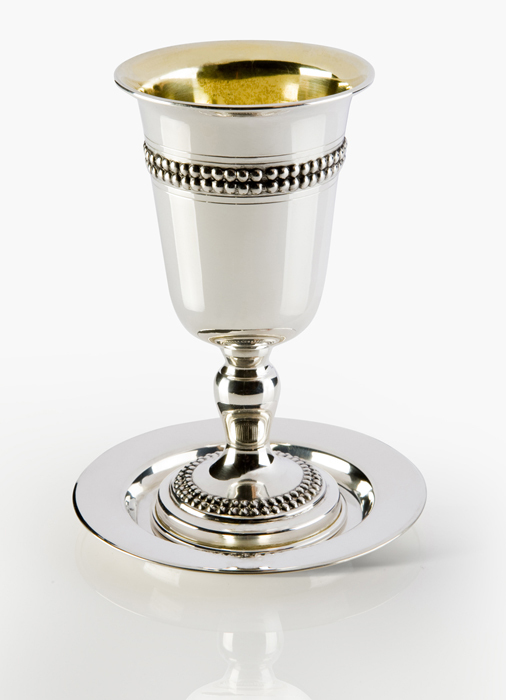 Double rows of filigree engraved beads encircle this 925 Sterling Silver Kiddush cup. The same filigree pattern is repeated on the goblet's foot and around the rim of the matching Sterling Silver saucer. Waserhstrum - creators of fine silver, has extensive experience and a reputation of reliability and service for over 40 years.